Baker County is a county in Georgia. As of the 2010 census, the population was 3,451. The county seat and only city is Newton. The county was created December 12, 1825 from the eastern portion of Early County by an act of the Georgia General Assembly and is named for Colonel John Baker, a hero of the American Revolutionary War. Baker County Courthouse in Newton. Baker County is included in the Albany, GA Metropolitan Statistical Area. 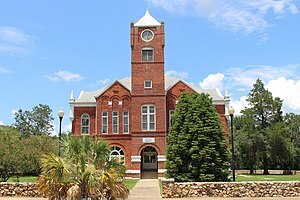 The Baker County Courthouse (Georgia) is listed on the National Register of Historic Places. Three other properties in Newton are also listed on the register: Notchaway Baptist Church and Cemetery, Pine Bloom Plantation, and Tarver Plantation. According to the U.S. Census Bureau, the county has a total area of 349 square miles (900 km2), of which 342 square miles (890 km2) is land and 7.2 square miles (19 km2) (2.1%) is water. The eastern half of Baker County is located in the Lower Flint River sub-basin of the ACF River Basin (Apalachicola-Chattahoochee-Flint River Basin). The western half of the county is located in the Ichawaynochaway Creek sub-basin of the same ACF River Basin. As of the 2010 United States Census, there were 3,451 people, 1,372 households, and 892 families residing in the county. The population density was 10.1 inhabitants per square mile (3.9/km2). There were 1,652 housing units at an average density of 4.8 per square mile (1.9/km2). The racial makeup of the county was 48.5% white, 46.7% black or African American, 0.7% Asian, 0.3% American Indian, 0.1% Pacific islander, 2.5% from other races, and 1.2% from two or more races. Those of Hispanic or Latino origin made up 4.2% of the population. In terms of ancestry, 7.3% were English, and 0.0% were American. Of the 1,372 households, 30.0% had children under the age of 18 living with them, 44.2% were married couples living together, 15.9% had a female householder with no husband present, 35.0% were non-families, and 30.5% of all households were made up of individuals. The average household size was 2.52 and the average family size was 3.14. The median age was 41.6 years. The median income for a household in the county was $27,462 and the median income for a family was $42,585. Males had a median income of $25,954 versus $25,688 for females. The per capita income for the county was $16,379. About 23.1% of families and 30.0% of the population were below the poverty line, including 49.1% of those under age 18 and 5.6% of those age 65 or over. As of the census of 2000, there were 4,074 people, 1,514 households, and 1,094 families residing in the county. The population density was 12 people per square mile (5/km²). There were 1,740 housing units at an average density of 5 per square mile (2/km²). The racial makeup of the county was 50.39% Black or African American, 47.42% White, 0.22% Native American, 0.02% Pacific Islander, 1.33% from other races, and 0.61% from two or more races. 2.72% of the population were Hispanic or Latino of any race. There were 1,514 households out of which 33.10% had children under the age of 18 living with them, 47.70% were married couples living together, 19.50% had a female householder with no husband present, and 27.70% were non-families. 25.10% of all households were made up of individuals and 10.80% had someone living alone who was 65 years of age or older. The average household size was 2.68 and the average family size was 3.20. In the county, the population was spread out with 27.30% under the age of 18, 10.00% from 18 to 24, 26.90% from 25 to 44, 22.10% from 45 to 64, and 13.70% who were 65 years of age or older. The median age was 35 years. For every 100 females, there were 86.20 males. For every 100 females age 18 and over, there were 86.30 males. The median income for a household in the county was $30,338, and the median income for a family was $36,438. Males had a median income of $25,891 versus $16,462 for females. The per capita income for the county was $16,969. About 19.90% of families and 23.40% of the population were below the poverty line, including 32.50% of those under age 18 and 20.10% of those age 65 or over. Baker County School System operates public schools. Although Barry Goldwater, George Wallace and Richard Nixon carried it in successive elections between 1964 and 1972, Baker County is historically Democratic. In 1956 Adlai Stevenson reportedly received over 96% of the county's vote. It has gone majority Democratic consistently from 1992 to 2012, but by much closer margins than that. In 2008 Barack Obama won with just 50.1% to John McCain's 49.1%. ^ a b "State & County QuickFacts". United States Census Bureau. Retrieved June 17, 2014. ^ Candler, Allen Daniel; Evans, Clement Anselm (1906). Georgia: Comprising Sketches of Counties, Towns, Events, Institutions, and Persons. State historical association. p. 114. ^ "Historical Census Browser". University of Virginia Library. Retrieved June 17, 2014. ^ "Population of Counties by Decennial Census: 1900 to 1990". United States Census Bureau. Retrieved June 17, 2014. ^ "Census 2000 PHC-T-4. Ranking Tables for Counties: 1990 and 2000" (PDF). United States Census Bureau. Retrieved June 17, 2014. ^ Baker County School System Retrieved February 23, 2011. ^ Leip, David. "Dave Leip's Atlas of U.S. Presidential Elections". uselectionatlas.org. Retrieved March 18, 2018. ^ Baker County Historical Society (1991). The History of Baker County. Newton, Baker County, Georgia, USA: Baker County Historical Society. pp. 54–69. LCCN 92080765.